Well, I'm going to keep this brief, as I am disappointed in the result. Weather/Training/Course: Hilly course, but nothing that would deter a PR in my opinion. Weather was a bit uncooperative (70s, humidity over 80%, high dew point), but I expect that by now. I decided to shoot for sub 1:11 with a 5:24 pace (so 1:10:47), since my mileage and speed have been great. The only thing I've lacked was specificity for the half marathon and LT- man did that bite me in the behind. Specificity, specificity, specificity. I feel like if I say it enough times, I'll get the hint that I need to work on it. The Race: I was all alone almost immediately in the race, which was too bad. I started relaxed, but was working way too hard by mile three- I just wasn't smooth. I didn't think that was a good read and assumed that I was just psyching myself out of it, but the wheels started coming off, and I was 13 seconds off by the 10k marker and falling and had only done one of the three main hills. I was dejected at that point and clicked into cruise control in the right lane so to speak, my pacing rose to 5:58/mile for miles 10-12. Mile 13 was okay (5:27), but that was only when I realized I was in danger of not even breaking 1:14. Fortunately, I rolled into the finish in 1:13:46 under that mark- however I will still have to grade this effort as a big, scarlet "F", having missed all four goals. I appreciate the win in the race, but that is simply dependent on who shows up. I do find some semblance of hope in that the second place guy was about 6 minutes behind me in 1:19, so maybe I lacked a bit of motivation later in the race because of that. As Drew would say, just send this one into the wood-chipper and move on. I can buy into that. I imagine you would do some serious damage on a flat course in cool conditions with lower humidity and dew point. Your stuff tends to be higher mileage and track interval focused, so as you note, holding these efforts for longer periods of time would help. But you can't do it all, even if you are pretty close! Thanks Jason- I've been really beating myself up about this result, so I appreciate the level-headed feedback. I decided to give the 'on-pace' stuff a shot these next couple weeks, so hopefully your advice is exactly what was needed! Sorry the race didn�t go as planned. As mentioned above, sounds like you�d do really well on a flat course and really see more accurately the results of your current fitness. Also, what shoes do you race in? 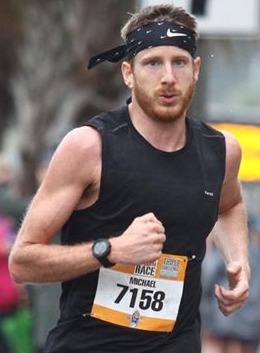 Reading over past race reports on the blog for some new options for the marathon distance. Hey Tara- I run halfs and marathons in my trainers which are Asics Cumulus. Although they are heavier, they do last 700+ miles pretty easily, feel like clouds, and you can find them for under $75 as long as you get the previous year's model. If you are looking for a fast shoe however, these are not a good choice, and you're better off going with a lighter, less durable option.